Jason Michaud stays hydrated while sunning himself in Portland's Monument Square during a heat wave in July 2018. Since 2010, Maine has broken five daytime record high temperatures for every record low temperature, according to a new Associated Press data analysis of temperature trends across the United States. The study shows that record high temperatures are on the rise in all regions across the country, though in some regions, such as the Northeast, the trend is more pronounced. 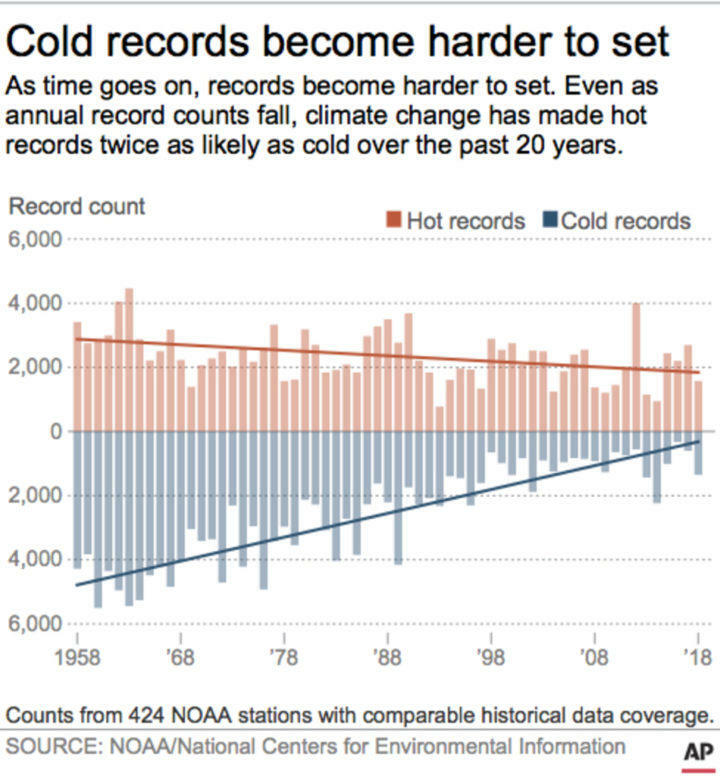 Nationwide, in the past two decades, the ratio of record high temperatures to record lows is about 2 to 1, according to the analysis. In Maine, the ratio skewed slightly higher to about 2.5 to 1 in the 2000s, and jumped to 5 to 1 in the past decade. That means, for every day of extreme low temperatures in Maine, there were five extreme high temperature days. Global warming, as defined by the National Aeronautics and Space Administration, is the unusually rapid increase in Earth’s average surface temperature over the past century primarily due to the greenhouse gases released by the burning of fossil fuels. AP conducted the data analysis to show the reality of global warming through extreme temperatures, something that affects people’s daily lives. AP collected data from 424 weather stations scattered throughout the United States, then counted daily record high and low temperatures from 1920 to the present. Only three weather stations in Maine met the criteria laid out in the study — stations in Farmington, Gardiner and Presque Isle. Compiling the data from those three stations — from 1920 through the 1940s — Maine saw more daily low temperature records than high. In the 1950s, the ratio was 1 to 1. From 1960 on, the ratio started shifting in favor of record high temperatures. But it wasn’t until 20 years ago that Maine began to have a significant imbalance of more high record temperatures than low, a trend that has grown rapidly in recent years. El Nino and La Nina are scientific terms describing fluctuations in ocean surface temperature that can have large-scale impacts on global weather and climate, according to NOAA’s National Ocean Service. La Nina is sometimes referred to as the cold phase, and El Nino as the warm phase. Birkel said that Maine’s increasing imbalance of high to low temperature records can likely be attributed to the state’s proximity to the warming ocean and Arctic region. Water vapor from the warming ocean traps the day’s heat, causing an increase in overnight low temperatures, especially in the winter, Birkel said. This makes setting nighttime low records less likely. In addition, Birkel said that warm temperatures stay later in the year, which scientists believe can be linked to the melting sea ice in the Arctic. “The air coming from the north is now warmer than it ever used to be … The summerlike weather [in Maine] tends to last about a week longer than it did about 15 years ago,” Birkel said. The people most adversely affected by high heat during Maine summers are the elderly, outdoor athletes and people who work outdoor jobs, such as roofers, said Bob Cravens, family nurse practitioner at Northern Light Urgent Care in Bangor. People who live in cities tend to suffer more from hot days than those living in rural settings because pavement and city buildings tend to trap heat. Heat-related injuries can include heat exhaustion and a more serious condition, heat stroke, when a person’s body temperature rises to 104 degrees Fahrenheit or higher. Even in a relatively cool state like Maine, people can develop heat injuries on the hottest days. For example, on a particularly hot August day in 2012, about 60 percent of the racers in the Beach to Beacon 10K road race in Cape Elizabeth suffered from a heat-related condition. One reason extreme high temperatures in Maine are so dangerous is the state tends to have high humidity at the same time, which prevents evaporative cooling — a natural cooling process in which sweat evaporates, removing heat from the surface of a person’s body. Warning signs for heat exhaustion and heat stroke include confusion, nausea, flushed skin, rapid breathing, racing heartbeat and headache, according to the Mayo Clinic. To prevent this, staying hydrated is key, Cravens said. It’s also important to seek shade and not overexert yourself on hot days, wear loose-fitting clothing, and protect yourself against sunburn, which can affect your body’s ability to cool itself. Global warming is a long-term temperature trend that is often difficult for people to grasp, Birkel said, especially when suffering through a cold snap in the middle of winter. But that, too, is linked to global warming, Birkel said. One example, Birkel said, was in February 2015, when Maine experienced its coldest month since 1934 with an average of minus 9 degrees Fahrenheit. Another example is the cold wave of late January 2019 in the central eastern United States. Looking to the future, Birkel said that based on historical trends and computer models that simulate climate, the scientists at the Climate Change Institute predict that these variations in temperature — with both heat waves and cold waves — will continue to increase in occurrence as the climate continues to warm.